I love that this place exists, even though I've only been here twice. 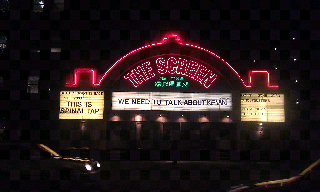 I guess that's the problem with small one screen cinemas that show 'This Is Spinal Tap', how often do you really go? I blog about independent film and about 'being an artist' every day, yet do I live it all the time? This cinema isn't too far from me and I could come here more often. It gives me a buzz just walking past it. It looks how a cinema should look. It looks how they look in the movies. It's Cinema Paradiso right here in Islington, London. To be honest I do have an excuse for never going here. I found it when I was going for a walk with a girlfriend many years ago. We saw a documentary and promised never to visit the cinema without each other. Weird how you remember things like that. I wonder if she's been here since. I say 'here' because I'm literally standing opposite it and blogging from my phone. I love that this place exists and I hope it's surviving well. I would go see a movie but I have a meeting in six minutes and then I'm off to East London for dinner with a friend. I need to come back soon, and preferably not with the ex-girlfriend. Oh, it must be so delightful in there. Join The Kid In The Front Row Facebook Fan Page!